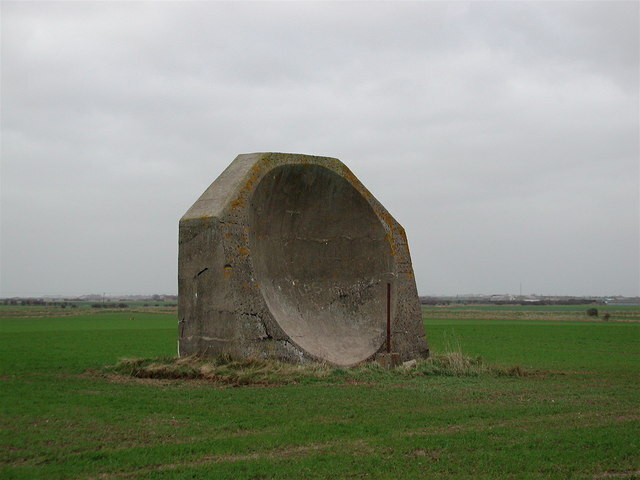 Rare 4.5 metre high concrete structure near Kilnsea Grange, northwest of Godwin Battery, a relic of the First World War. On the pipe in front of the acoustic mirror was a trumpet-shaped ‘collector head’, a microphone which could pick up the reflected engine sound of Zeppelins approaching from the sea. Wires passed down the pipe to a listener seated in a trench nearby with a stethoscope headset, who would try to determine the distance and bearing of any enemy airships. This page has been viewed about 2801 times.